The Cards will be looking to win a fifth successive league match for the first time in four years on Saturday as they take on an out-of-sorts Concord Rangers side that have been heavily beaten in their last two games. For the fourth time in just eight matches so far this season Alan Dowson saw his side come from behind to win last Saturday as a Max Kretzschmar double cancelled out Jake Robinson’s early penalty for Billericay Town and extended the Cards’ lead at the top of the table to five points – a very encouraging start for what is still a very new team and one which is arguably yet to hit top gear. Concord, managed by former Dover Athletic, AFC Wimbledon and Leyton Orient midfielder Sammy Moore, who most recently had a spell in charge of Leatherhead last season, matched the Cards stride for stride at the top of the table over the course of the first six games but have fallen away badly over the last couple of weeks – losing 5-0 at home to Welling United before being beaten 4-1 at Chippenham Town in a game which they had taken the lead. Despite their patchy form the Beach Boys proved in last season’s two FA Cup encounters that they will be far from a pushover and the Cards will need to continue their run of steadily improving performances if they are to take all three points. Dowse has been reluctant to rush back the injured trio of Jake Hyde, Christian Jolley and Charlie Wassmer, although all three are thought to be close to a return. Hyde, who has scored twice in his four appearances for the club, was an unused substitute again Billericay, whilst Wassmer completed a full 90 minutes in the friendly against Westfield in mid-week. There has been no word yet on centre-back Ian Gayle although with Wassmer and Nathan Collier ready to deputise for Jack Cook or Kiran Khinda-John, the Cards do at least have plenty of options. Perhaps the area most of interest for supporters will be the front four. Kretzschmar, with six goals to his name already, has been the only ever-present thus far. Paul Hodges, who signed a contract extension this week, has started the last couple of games along with Nicky Wheeler and Greg Luer, but Dowse will know he has the likes of Reggie Young, Duane Ofori-Acheampong and a returning Hyde waiting in the wings should he wish to utilise them. Declan Appau, who has made just one substitute appearance so far this season, featured for Farnborough last weekend and looks set to continue with our neighbours to get some game time. The most familiar name in the Concord team is former Woking-loanee Billy Knott who scored 10 goals in 22 appearances for the Cards during the 2012/13 season and went on to play for the likes of Bradford City, Gillingham and Lincoln City in the Football League. He returned home to Essex this summer after reported personal problems and we’re sure all supporters will want to wish him well after the game on Saturday – provided, of course, that he doesn’t score! Against Chippenham, Concord lined up with another former Woking player, Sam Beasant, in goal; a back four of experienced right-back Sean Clohessy, who followed Moore from Leatherhead and is best known for him time with Southend United, yet another former Card in left-back Frazer Shaw and centre-back pairing Tyrone Sterling and Sam Blackman. In midfield was Lee Minshull, who was part of the successful Newport County team promoted to the Football League and was also with Moore at Leatherhead, alongside Knott, Ryan Hayes and Danny Green; whilst up front was veteran forward and assistant manager Jack Midson alongside former Maidenhead United and Luton Town target man Alex Wall – the duo already have 10 goals between them this season. The Cards came into the original tie at Kingfield, played three days earlier, in a confident mood off the back of five wins and a draw from six league games. However, Woking needed a very late Jamie Philpot goal four minutes from time to earn a replay, and the return game proved little easier. Regan Charles-Cook gave the visitors an early lead but this was cancelled out before half-time by Femi Akinwande. It took until the 117th minute for the Cards to force a winner deep into extra time through Charlie Carter, a goal which did of course set us on the way to a memorable cup run. Sadly, the Cards would win only twice more between the second game with Concord and the end of January, and no doubt Dowse will be keen to avoid any such repeat this time around. The Aspect Arena can be found on Thames Road, Canvey Island, and the postcode is SS8 OHH – it’s around a one hour and 25 minute drive from the Laithwaite Community Stadium. The nearest station is Benfleet, about three miles from the ground, and a short taxi journey costing around £10 may be required to reach the ground. Trains from Woking to Benfleet go via London and take around two hours in duration. Matchday ticket prices are £12 for adults, £7 for concessions with those between the ages of 12 and 16 costing £3. The Cards take on Dulwich Hamlet at the Laithwaite a week on Saturday. Seven days later we enter the second qualifying round of the FA Cup, for which the draw is yet to be made, and we finish our September fixture list with a trip to Torquay United. 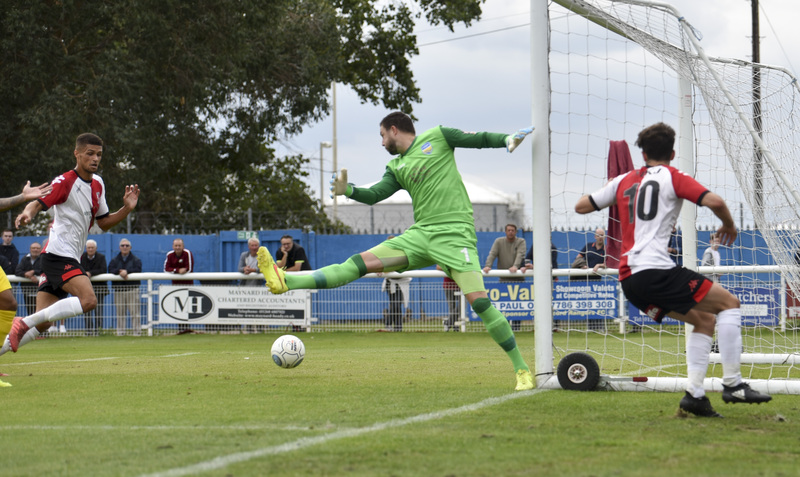 Following last week's hard-fought home victory against Billericay Town, another stern test from Essex faced the Cards this week in the shape of Concord Rangers. The 'Beach Boys' had made a strong start to the season and despite a couple of poor results in the last couple of weeks, they were still in a play-off spot ahead of kick off. For the Cards, the trip will bring back good memories of victory here in the FA cup last season as Charlie Carter notched home late in extra time. In a competitive contest from the outset, Woking had the better of the first half, and went into the break a goal ahead, Greg Luer opening his Woking account with a tap in from close range. Concord were more determined in the second half and had the better of it, snatching a point with a late equaliser from former Card Billy Knott. Duane Ofori-Acheampong didn't help the Woking cause by being sent off not long after coming on for two yellow cards in the space of a minute for time wasting and dissent. Both teams entered to the emphatic 'Insomnia' by Faithless, but as one home fan remarked behind me, not coming out to a Beach Boys record is surely an opportunity missed? The backdrop to the Aspect Arena was cloudy overhead but with enough blue sky and sunshine coming through to form a dry, warm afternoon. Backed by a good away following and in good voice, Woking were unchanged from the victory last week, lining up in the same 4-2-3-1 formation. In addition to Knott, Concord’s squad included former cards Sam Beasant and Frazer Shaw and a number of ‘refugees’ from Leatherhead. A pattern of both teams looking for joy from searching balls from midfield quickly emerged, with an eagerness to counter at pace when the opportunity presented itself. Woking had some of their best chances inside the opening quarter of an hour. A long ball from Jack Cook found Max Kretzschmar on the attacking right, his cross found Luer who headed against the marking defender and won a corner. The resulting ball-in nearly produced an own goal as a trailing foot diverted the ball toward goal, but instead trickled wide for another corner. On 8 minutes Concord created their best chance of the half following a corner kick, after being initially cleared Aron Pollock struck on the volley just outside the box but it was a comfortable pace and save for Berti Schotterl. Paul Hodges was at the heart of most of Woking's attacking play, making headway through the middle of the park with good close control and tenacity and having a shot blocked, which inadvertently tee'd up the industrious Armani Little to blaze over from 25 yards out. Hodges was at it again through the centre, teeing up Nicky Wheeler whose low effort from the left came back off the near post, and back to Hodges who then shot over. Hodges turned provider for Luer who flicked on for Kretzschmar, who had his shot blocked. Along with Hodges, Josh Casey and Wheeler were getting success down the left side and it spawned a couple of decent chances for Woking around the 20 minute mark. Luer dropped a bit deeper, flicking the ball on nicely for Wheeler who did really well to keep the ball in play, and dug out a cross for Kretzschmar to head on target but straight at keeper Beasant. Casey then fed Luer who again held up and flicked on effectively, but put too much on the ball for the chasing Wheeler to catch, Beasant just winning the race to claim it. Concord started to show frustration, Shaw receiving a talking to from the referee following a firm tackle on Kretzschmar, before Sam Blackman picked up the first yellow card of the game on 26 minutes for a late challenge on the halfway line. On 29 minutes Woking broke the deadlock, Josh Casey burst down the left channel and found Wheeler, who stood up a ball to the back stick for Kretzschmar to nod back across, and with the goalkeeper having committed himself, Luer tapped into an open net, sending the travelling fans behind the goal wild. Knott started to become more effective for Concord as the game wore on; he put a few troubling balls into the box which Khinda-John and Cook managed to deal with, the former fortunate to not be penalised for a shove in the back. An offside decision broke up the spell of pressure and Casey had to leave the field to receive treatment for a knock on the face. Concord then made the first substitution of the game on 37 minutes for what looked like a possible injury, Jed Smith replacing Sean Clohessy. Towards half-time Hodges was again in the thick of the action; he was physically targeted by Concord and was unfortunate not to win a couple of free kicks in dangerous areas. He found Kretzschmar on the right who passed to Luer who - despite adjusting his neck well to generate power - sent a header over the bar. Wheeler showed trickery on the left, sending another cross in moments after, but easily caught by the keeper. Khinda-John was again fortunate not concede a penalty after another shove, this time on Midson. Woking kicked off the second half but it appeared that Moore had gotten into his players at half time, as Concord had Woking pegged back into their own half for the opening 5 minutes. A good ball in from Knott was headed over by Jack Midson, and served as a warning shot to the cards. When Woking did finally get out their half they put together the best passing move of the match, patient, measured build up play driven by Casey and Little, ultimately leading to a corner. Played quickly and short, Hodges had a shot blocked at the near post. Concord continued to push harder, winning the second balls, still seemingly targeting Hodges yet drawing niggly fouls from Ferdinand and Little, Luer being pulled back increasingly deeper. The front two of Midson and Wall stretched the Woking back line and forcing them into rushed clearances. Just shy of the hour mark, a powerful long throw from Jed Smith managed to get through the box from the right hand side with Wall getting contact from a few yards out but somehow guiding up and over the bar. Lee Minshull put a long ball over the top for Midson which asked another question of the defence, before Pollock put a great cross into Midson from the right channel and remarkably, with a sizeable amount of net gaping, he headed wide. On 65 minutes Adam Topley replaced Blackman for Concord. In response, Dowse opted to bring on Duane Ofori-Acheampong on 68 minutes. Within a few minutes an opening looked on for Woking as Kretzschmar was released through midfield, Ofori-Acheampong in a good position further forward, but Kretzschmar's through ball lacked accuracy and was intercepted. On 79 minutes the change suddenly turned costly for Woking as Ofori-Acheampong received two yellow cards within the space of a minute. With a free kick having been awarded to Concord in their own half, Ofori-Acheampong kicked the ball away and took time to retreat from the incident. Upset by the award of the yellow, something untoward must have been directed at the referee who then brandished a second yellow and red. Concord kept advancing in stronger waves. Midson and Wall were causing the back line many problems, switching channels, reacting well on effective balls driven in, particularly from Knott and Popo. Knott went close with a half volley from just outside the box, the ball spiralling away from the near post, flying just wide. Concord's final change in the 80th minute saw Ryan Hayes came on for Tosan Popo. The sub was immediately effective, pinging balls into the box which Wheeler and Cook managing to deal with them. In dealing with another ball in, Wheeler was fouled inside the six-yard box and Woking breathed a sigh of relief as a sure tap-in to an empty net awaited had the whistle not been blown. Midson got a shot away from the left corner of the area, saved well by Berti. Looking to close the game out, Dowse replaced Wheeler with Charlie Wassmer, the much touted centre half making his first appearance for the club. The final substitution came on 90 minutes as Hodges, who was replaced by Reggie Young. The effort to shore up wasn't quite having the desired effect as Khinda-John was punished for a push in the back 25 yards out which thankfully came to nothing and Berti was cautioned for time wasting, delaying the taking of a goal kick. With 5 minutes added time on, Concord finally broke through, Woking not clearing their lines after a bit of a scramble, Midson touching the ball on to Knott who dispatched a volley low from the edge of the box, averting a few bodies on the way in. Late opportunities for both sides followed after, Minshull was flagged offside for Concord having received a nod back across the area and Little put a ball through for Kretzschmar who was through on goal but just could not trap the ball. Wassmer was frustrated he gave away a free kick 30 odd yards from goal, Berti punched it away. Minshull then hooked it over the bar in the dying seconds. Prior to the game, a point would have been considered a good result, but the manner of the performance in both halves will leave Cards fans frustrated to have not come away with all three. Unable to capitalise on the better chances and general good play up top in the first half, the lesser resistance to Concord's increased pressure, capped by the ill-disciplined sending off of Ofori-Acheampong, made for a testing second. Dowse will be looking for more composure from his backline and a bit more patience in the middle of the park. With this tricky Essex double bill out the way, the Cards return home next Saturday with an opportunity to get back into the winning habit against newly-promoted Dulwich Hamlet. Man of the Match: Paul Hodges. Once again, Woking’s brightest spark, spearheading attacks with his tenacity, close control, deceptive pace through the middle, and often finding a final ball.